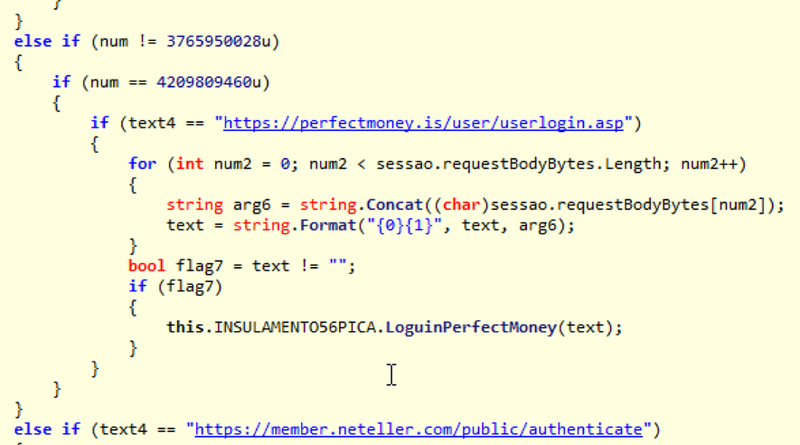 While hunting some phishing emails these days, I came across a malware campaign similar to EngineBox, a banker capable of stealing user credentials from multiple banks . XPCTRA, as I call today’s variant, in addition to banking data, steals online digital wallet users’ credentials from services such as Blockchain.info and PerfectMoney. The malspams used in the campaign try to induce the victim to open a supposed bank bill link. It actually leads to the download of the XPCTRA dropper, that is, the part of the malware responsible for environment recognition and downloading new components. Once executed, it initiates a connection with an Internet address to download other malware parts responsible for later malicious actions. In this diary, I present the XPCTRA analysis the indicators of compromise used in this campaign. Unlike the previous variant, XPCTRA (read it like “expectra”) does not make use of as many layers of encoding as EngineBox did to try bypassing security layers, which made the analysis simpler. 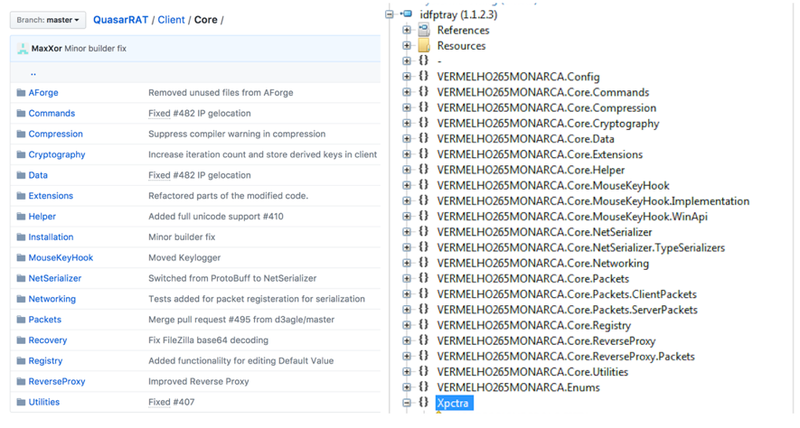 NOTE: The XPCTRA sample analysed here (idfptray.exe) was not yet known by VT (VirusTotal) until my submission. After posting EngineBox malware analysis  last month, through community feedback, I came to know that the threat embedded a framework called Quasar RAT  developed in C#. The goal of this framework is to provide a tool for remote access and management of Windows computers— hence the name, RAT (Remote Access Tool). 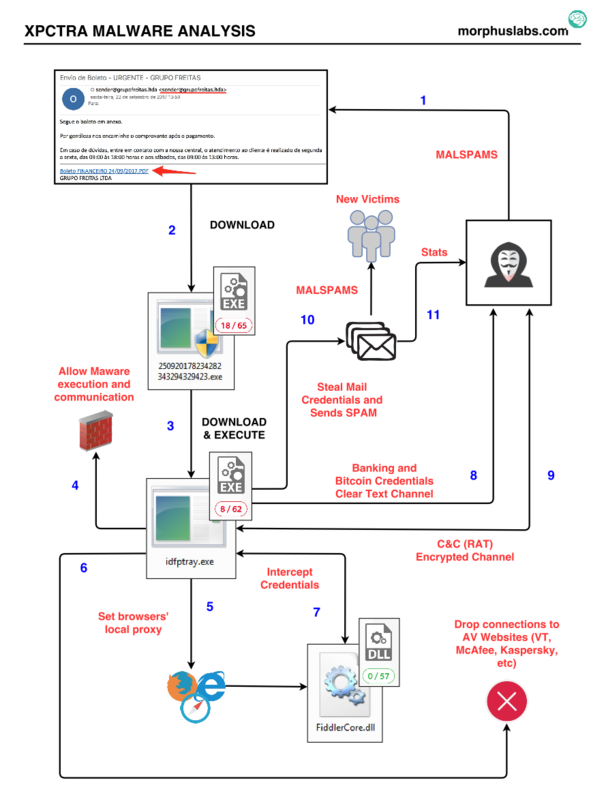 It turns out the variety of functions the open-source framework has, such as remote desktop, keylogger, etc., made it quite attractive for cybercriminals who ended up using it as a RAT (Remote Access Trojan) tool within their malware. Notice in Figure 2 the similarity of Quasar RAT directory tree on the left, and the XPCTRA code on the right. In addition to Quasar, XPCTRA incorporates Fiddler to play the role of HTTP Proxy and, of course, the code responsible for intercepting communications with financial institutions and sending SPAM as well. In addition to banking credentials, XPCTRA is able to steal digital currency wallet’s credentials hosted online like Blockchain.info, PerfectMoney and Neteller. Look at Figures 3 and 4 for code snippets of capturing moments and sending user credentials from some of these institutions. The result of this analysis draws our attention to the security of digital currency wallets, especially those “hosted” in the cloud. Just as customers of traditional financial institutions have faced over the years the most diverse fraud attempts and had to protect themselves, so should digital money users. Give preference to services that offer a second authentication factor for transactions and be sure to enable it.